For L.A. parents ready to ring in 2016 with the kiddos—that is, without keeping them up 'til midnight (or even 9 p.m. to catch the East Coast version), Discovery Cube Los Angeles is rocking Noon Year's Eve on December 30 and 31! Will is gonna go crazy when he finds out that the celebration involves superheroes! In fact, families are encouraged to come in superhero costumes and join in the awesome superhero dance party while making superhero masks! Watch out for a baby Batman is all I'm saying! Hats and Horns to help celebrate the new year! Remember to stop by on December 30 or 31, and watch the ball drop at 12 p.m. or 2 p.m. and toast the New Year with kid-friendly ginger ale! 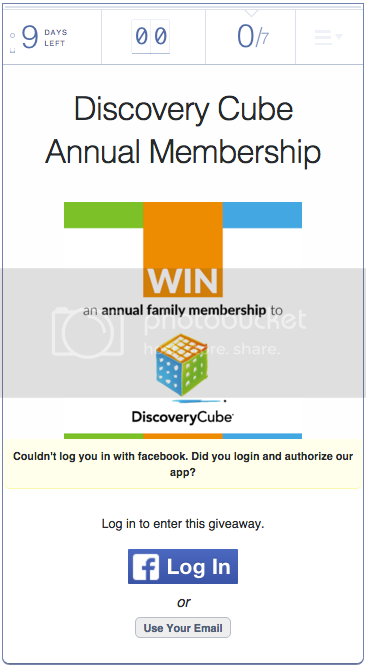 The Discovery Cube LA Mom Ambassadors are giving away 1 Annual Family Membership to Discovery Cube. 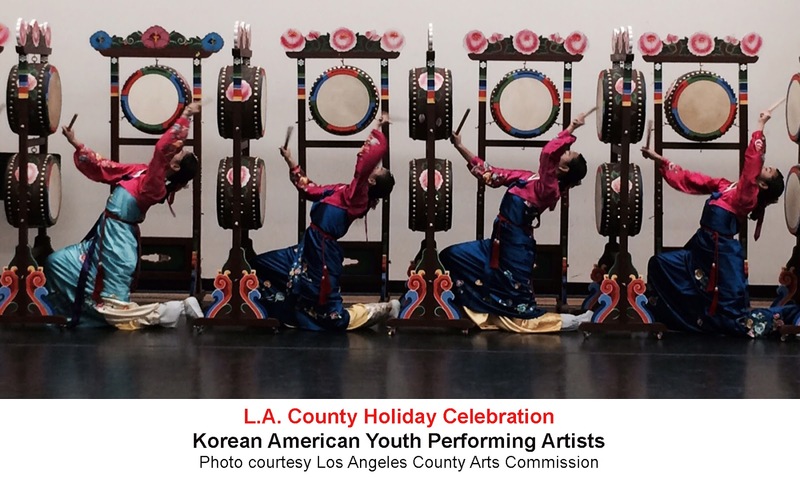 UPDATE: Congrats to Kayley, who won the 4 tickets to LA Zoo Lights! Please email me at losangelesstory@gmail.com, and I will send them your way! Stop what you're doing right now, and plan a family trip to see the LA Zoo Lights! 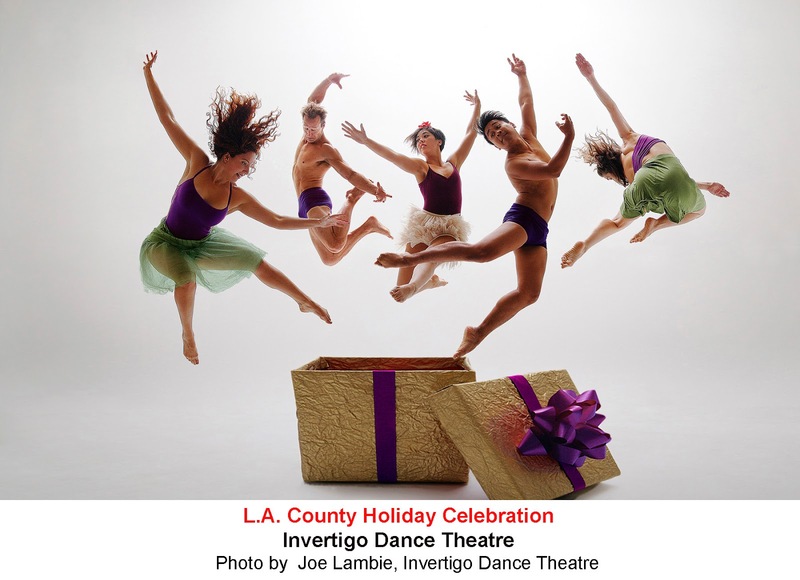 The holiday attraction, which runs now through January 3, 2016, is fabulous fun for the whole family. CC and I went on opening night, and there was literally a line around the side of the zoo. It is a super-popular event, so be sure and grab tickets soon—or enter my giveaway below! Walking into the Los Angeles Zoo at night is absolutely magical. CC and I had never seen the zoo this late, and it felt that much more special to see one of our favorite LA attractions after dark. LA Zoo Lights is open every night, except Christmas Eve and Christmas Day from 6 p.m.-10 p.m. Mondays-Thursdays and 6 p.m.-11 p.m. Fridays-Sundays and Dec. 21 and 23. We even stopped by Reindeer Village, which was all decked out in colorful lights and featured a few reindeer to boot! Don't forget to stop by Reindeer Romp and meet Velvet and his reindeer friends. Special nights during LA Zoo Lights include Holiday Happy Hour on December 10 (tickets: $75). Grown-up guests can enjoy holiday cocktails, hors d'oeuvres, wine and beer along with VIP tickets. Then there's Family New Year's Eve (tickets: $65 for adults and $40 for kids), which offers admission to LA Zoo Lights on December 31, a dinner buffet, carousel ride, crafts, a DJ dance party, cash bar and a champagne toast at 9 p.m. as the ball drops in Times Square. Whatever you plan to do this holiday season, don't miss the LA Zoo Lights! 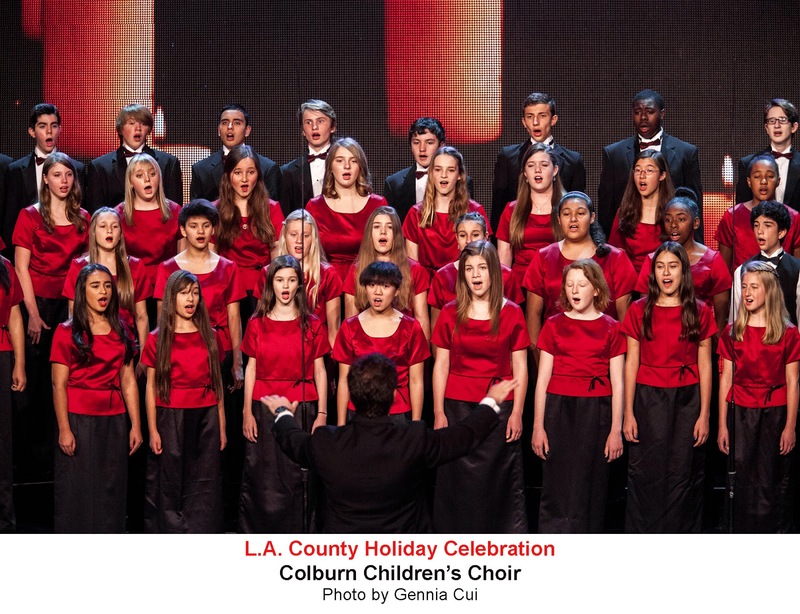 6 p.m.-10 p.m. Mondays-Thursdays and 6 p.m.-11 p.m. Fridays-Sundays and Dec. 21 and 23. I'm giving away 4 tickets to the LA Zoo Lights, courtesy of the Los Angeles Zoo! To enter, leave a comment below, telling me your favorite part of the LA Zoo. For more chances to win, share this giveaway on Twitter and/or Facebook. 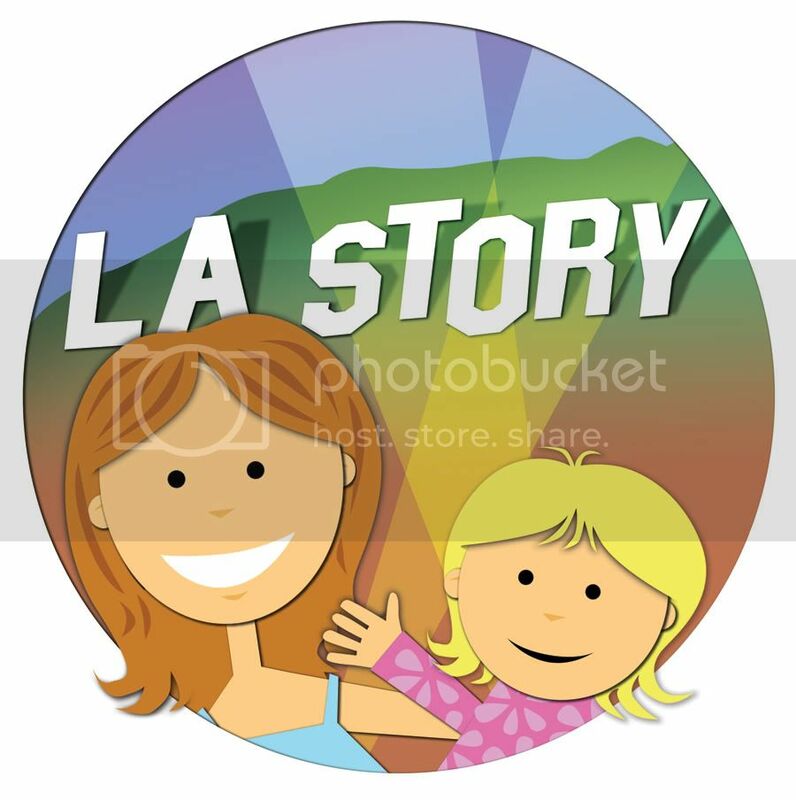 I'm at @la_story on Twitter and here on Facebook. Good luck, and I will announce the winner on Monday, December 14! 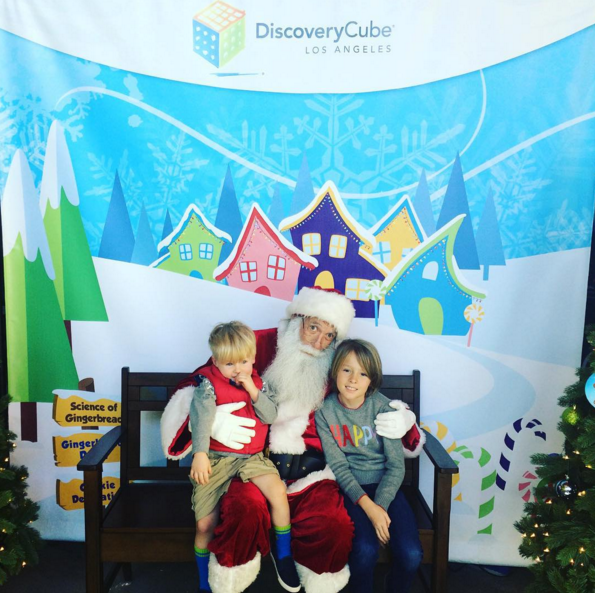 Guess who met up with Santa at Discovery Cube Los Angeles? Christmas and all of its accompanying holiday fun could not get started fast enough this year! 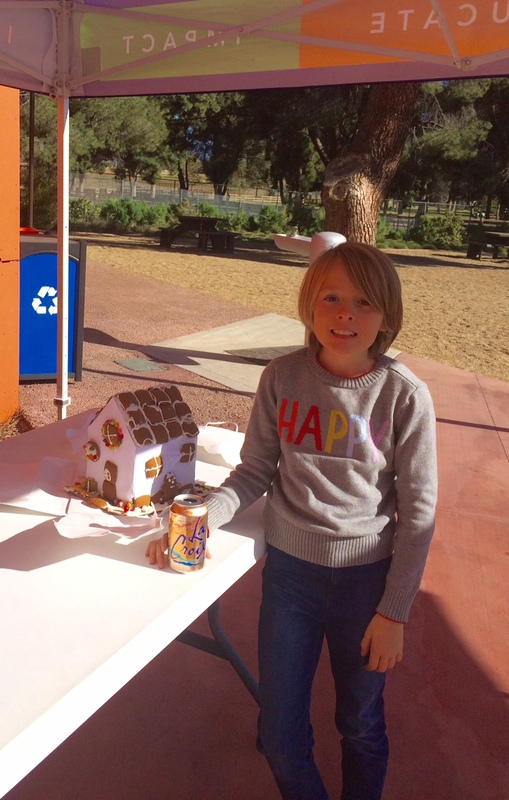 So the kiddos and I could not wait to deliver CC's gingerbread house creation to Discovery Cube Los Angeles' annual "Science of Gingerbread" competition—and check out the rest of the exhibit as well! After dropping off her gingerbread masterpiece, we went inside to check out all of the new, hands-on features that are part of the "Science of Gingerbread" exhibit, which runs through Jan. 3, 2016, at Discovery Cube LA. First, we met up with Santa (pictured up top). I was so excited that Will was OK with sitting on Santa's lap. He can sometimes be wary of sitting on anyone's lap—including his parents'—so this was a big success. Then we saw a gorgeous display of gingerbread houses that had been entered into the competition. People got so creative! Loved the oversized marshmallow pigs. We'll have to try those next year. The kids also indulged in a little cookie decorating. (The next sessions will come this weekend.) Somehow they both managed to cover their faces in frosting, but hey, it was fun for them to pick the color of icing and sprinkles for their cookies, so why not? 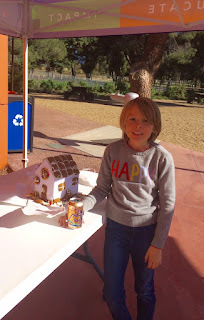 CC and Will could not resist the Gingerbread Derby, which invites kids build their own race cars out of fun, edible materials like graham crackers, jelly beans, mints (for wheels) and gummy bears. Will, who has a total sweet tooth like his mom (ahem), basically just wanted to eat it until he realized that his car could actually move—and raced really well on the exhibit ramp. CC and Will build their gingerbread race cars. While this was our last activity for the day, there were plenty of other fun holiday-themed activities for kids to do. They can also learn about chemistry in the kitchen—which ingredients dissolve more easily in water? 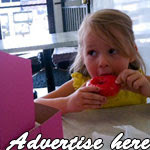 There's also the Gingerbread Spice and Build a House Learning Stations and the Science of Snow Stage Show. Take a pic with Santa this weekend or between Dec. 19-24. CC and Will show off—and start eating—their gingerbread cars. We had a fantastic time, and the kiddos are already asking to go back!